Deep learning takes place when we have the opportunity to struggle with ideas, and discussion is a tremendously powerful vehicle for students to engage in that mental effort. Formulating your own ideas into words, listening to others’ ideas, and becoming aware of contradictory ideas all set up learners to make better sense of the world. Promoting discussions among learners helps instructors to better understand what students are thinking,and to make better instructional decisions to help them deepen their understanding. Discussions create an open intellectual environment where ideas are exchanged. Settings in which deep learning is the goal are often teeming with discussion. Discussion-based instruction can be challenging. Leading an effective meaning-making discussion requires curiosity, skills, knowledge, and experience on the part of both instructor and students. The tone set by the instructor is crucial. Do learners feel safe to share ideas and ask questions about what they don’t know? Outdoor science schools provide an ideal environment for developing and refining these skills, as instructors get to work with diverse groups of students and to repeat and refine activities throughout a season. This session provides valuable knowledge, strategies, and discussion practice to help instructors treat outdoor science schools as a laboratory for developing their discussion-leading skills. Understand the profound role discussion plays in the learning process, specifically in scientific meaning-making. 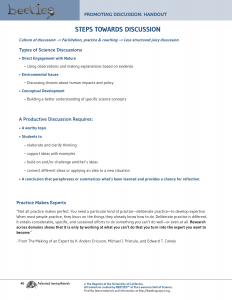 Learn about a wide variety of discussion routines and strategies. Practice leading discussions, using discussion tools and instructor moves.